Part of being a good cook is not only knowing how to cook well but also what to do with leftovers, and this is just as important--I think--whether you are cooking in a home kitchen or a commercial one. Two meals I cooked today are good examples. Pictured above is a closeup of chile con carne I made for the staff at work with leftover pieces of cooked prime rib...more like a chili con prima carne. It was delicious...the rib was already cooked and tender--mostly end pieces I had leftover from a dinner I served a few nights ago--so I diced them and added them to a pot of chili I was making. 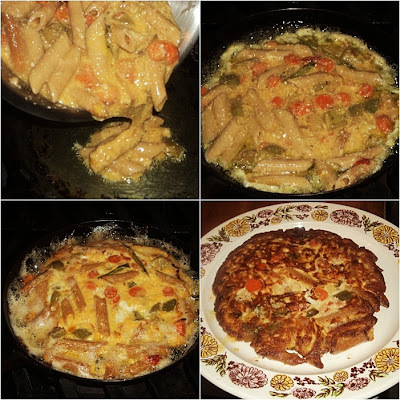 Below is a picture of a simple frittata or torta di pasta I made for dinner tonight (click here for previous posts on frittata--or frittati--with more explicit pictures and recipes). This is such a simple and delicious dish, and it's also an easy one to make for myself when I'm home alone because it's ready in minutes. I had a small portion of pasta and vegetables aglio e olio leftover from dinner last night (click here to see how to make aglio e olio like a pro) but it wasn't enough for a full portion...so I mixed it with a couple raw eggs and some grated Parmesan and put it in the oven (after I seared it on the stove top). By the time I fed my dogs, checked email, and washed a few dishes it was ready. With a pear and a glass of wine it made for a quick but complete and delicious dinner. 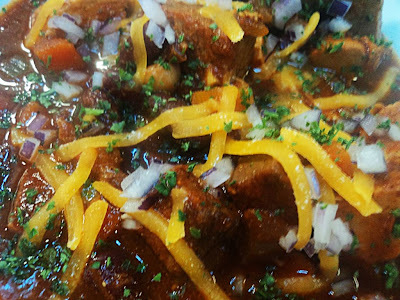 Sometimes--I really think--leftovers are not only as good, but actually better than the original recipe. Heat the oil in a heavy-bottomed pot over high heat, then add the diced chicken breast and brown it. Remove the chicken and set aside. Add the onion, celery, carrots, and red pepper; sauté about 5 minutes. Add the garlic and jalapeño; sauté 2 minutes. Lower the heat to medium and add the chicken back to the pot. Stir in the chili powder, cumin, cinnamon, paprika, oregano, sugar, salt, and pepper. Stir and cook for 2-3 minutes. Add the tomatoes, broth, puree, and hot pepper sauce. Bring to a boil then lower to simmer. Stir in the beans and cook for 30 minutes. Stir often to avoid scorching.